It takes many people, many talents and many gifts to help our neighbors stay in their homes when a temporary financial crisis hits. Together We Cope volunteers make it possible. In our food pantry, volunteers make sure hungry families get nutritious food. Our food pantry receives donated food from grocery stores and food drives. Volunteers are needed to sort, clean and ensure that foods meet quality control standards. 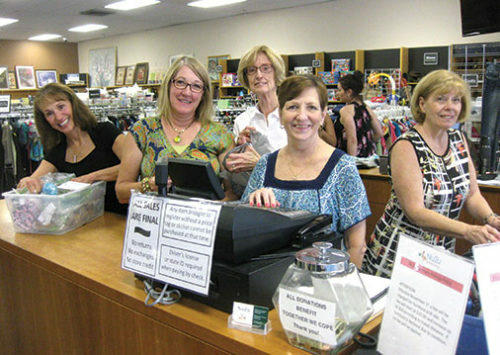 In our resale shop they sort donated items, organize merchandise, provide excellent customer service, create window displays, stock shelves, perform cashier duties, and many other tasks. At our special events, they help create an experience the community loves to support. Not sure what you’d like to do, but you know you want to help? Do you have a special skill or interest you’d like to share with us? Pick a date and time that works for you and then email Cathy Trongeau our volunteer and community service coordinator, or call her at (708) 633-5040, ext. 7221.